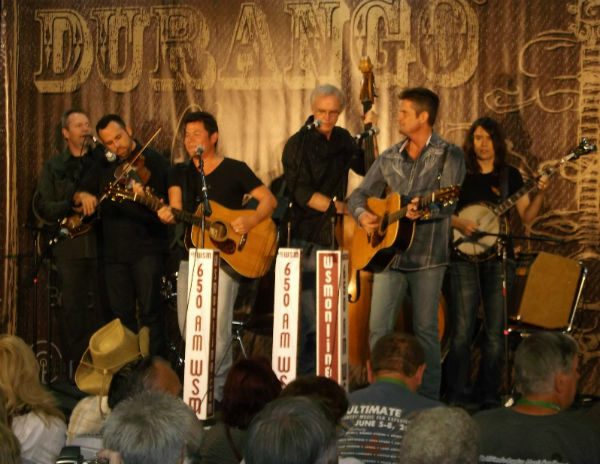 Formed in 2004, the Grascals have emerged as one of the top bands in modern bluegrass, garnering IBMA awards and Grammy nominations while sharing the stage with the major acts of bluegrass and country music. While the individual band members had long been working professionally on major bluegrass circuits, they never could have anticipated the success they would come to have when they teamed up. Even before their first album was completed they found themselves working with Dolly Parton, who had been recording bluegrass albums for several years. The group also has now appeared on the Grand Ole Opry more than 100 times, and has recorded with the likes of Dierks Bentley, Brad Paisley, George Jones and other stars of country music. The group’s latest album, Life Finds a Way on Mountain Home Records, features “Pretty Melody,” a song based on a guitar line of Johnson’s that went to the top of the Sirius charts. While the group records a fair amount of original material, the Grascals also are known for unlikely covers of tunes by artists from the Monkees and Waylon Jennings to James Taylor and Elvis Presley. The band is known for the harmonies of its three male singers, but Johnson said that the group’s female banjo player, Kristin Scott Benson, will soon be getting her turn at the mic. “Kristin and I are doing a song called ‘Getting Down Tonight’ for the next record,” Johnson says. The song was written by Johnson and his wife with John Scott Sherrill (Josh Turner, Alison Krauss). Given the number of country music connections the band has made, one might wonder if the Grascals are thinking about moving a little more mainstream. But Jamie Johnson makes it clear that that probably won’t happen anytime soon.